Pickup On South Street is one of the most brilliant movies ever made. An example of the directing: When Candy (Jean Peters) starts going through her purse and notices her wallet is missing, an alarm goes off in the background in the building she’s in — as if it’s an alarm going off in her head. It’s not cartoon-like — it’s subtly woven into the background in a way that strikes you on a subconscious level until you’ve seen the film a few times and it just “clicks” that there’s an alarm bell going off when she starts frantically going through her bag. Richard Widmark is way on top of his game as a smart-alec — he’s really great — but the highlight performance of the film was the first scene for “Moe,” the street peddler/informer, played by Thelma Ritter. Later, in her apartment, you are not seeing a movie — you’re seeing a real person. I’ve never seen anyone “act” so real I felt like I was looking into a real room until Ritter’s performance — right down to the way her hair stuck out a bit when she removed her hat. About a million other things just *worked,* from the way Lightning Louie picks up money with his chopsticks to the way Candy’s jewelry clicks when she flicks Moe’s hand away from her brooch, to the way Moe gets the dollars and change from the police captain across the FBI guy’s chest — and even the way the captain opens his filing cabinet, like he’s been doing it in that way in that room for many years. 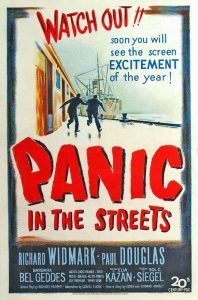 “Pickup On South Street” is detailed moves (directing) with consummate performances (acting) and superb now-nostalgic visuals of the day, such as the panel truck, the boards leading to the shack out on the water, the dumbwaiter, — and the unforgettable place Skip stashes his pocket pickings. Wonderful stuff. “Pickup On South Street” is also one of the few movies where, even though the characters aren’t perfect, you do care about them — perhaps because they have been somewhat branded by their pasts in ways that are hard to escape: Skip as a “three-time loser” and Candy as a youngish woman who has “knocked around” a lot. When these people behave a little more badly than you’d expect, it’s in sort of novel ways that make it seem you’re looking in at people you’d never otherwise imagine — and yet you know that they are possible because the actors make them so recognizably human.